Smart Vision Lights revolutionizes the machine vision lighting industry with a intelligent constant current driver in every machine light. A separate driver is no longer needed, all our machine vision lights have the constant current driver included in the machine light making no additional wiring necessary. Our small and extremely powerful drivers are specifically engineered for lighting machine vision camera's in the vision industry. All our machine vision lights feature a PNP and NPN led strobe light or pulse input. 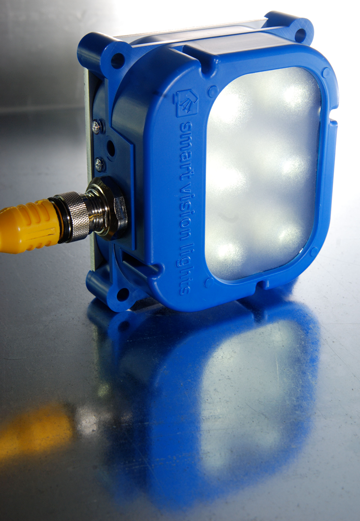 Smart Vision Lights uses only high current, HB (High Brightness) LED's in our machine lights. Smart Vision Lights designs, manufactures and markets a line of products that apply the benefits of high current LED's for use in machine vision applications. All machine vision lights use standard industrial 24VDC for operation. The SMART driver has the option to run the machine light in a constant LED illumination including analog and variable intensity control. The analog feature allows 0-100% intensity control of the machine vision light through a 0-10VDC signal. The variable feature allows 0-100% intensity control of the machine light thru an integrated potentiometer. HTE Automation supplies Kansas, Missouri, and Illinois with lighting solutions for factory automation.